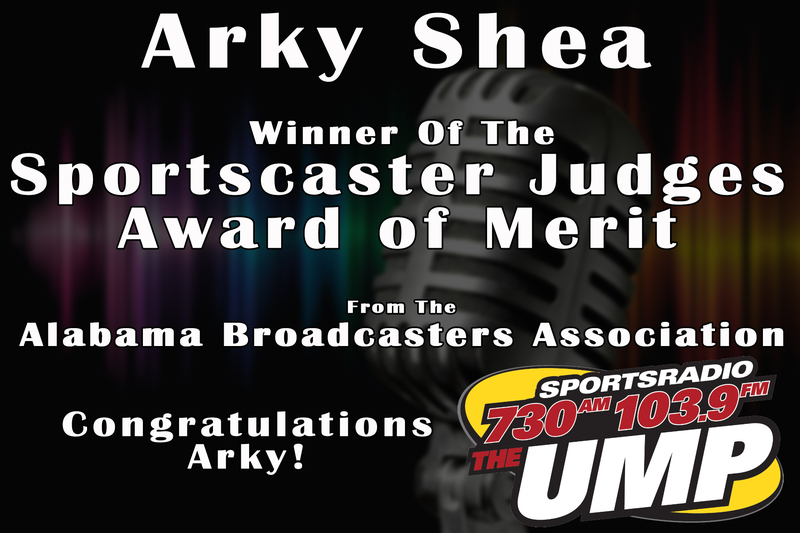 THE UMP’S ARKY SHEA WAS HONORED WITH AN AWARD AT THE ALABAMA BROADCASTERS ASSOCIATION’S ANNUAL “BEST IN BROADCASTING AWARDS” ON MARCH 25. 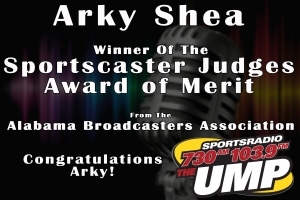 ARKY CAN BE HEARD WEEKDAYS FROM 6AM TO 10AM ON “THE COLE CUBELIC SHOW” AND SATURDAY MORNINGS FROM 9AM TO 11AM ON “THE SPORTS FLOOD WITH ARKY SHEA.” BOTH SHOWS AIR ON SPORTSRADIO 730AM/103.9FM “THE UMP” WUMP. YOU CAN ALSO STREAM THE STATION AT UMPSPORTS.COM ON VIA THE UMPSPORTS APP. THE UMP WOULD ALSO LIKE TO CONGRATULATE “THE DALE JACKSON SHOW” ON OUR SISTER STATION, WVNN, FOR BEING NAMED “BEST RADIO TALK SHOW” BY THE ALABAMA BROADCASTERS ASSOCIATION. TO LEARN MORE ABOUT THE ALABAMA BROADCASTERS ASSOCIATION AND THE “ABBY” AWARDS, CLICK HERE.